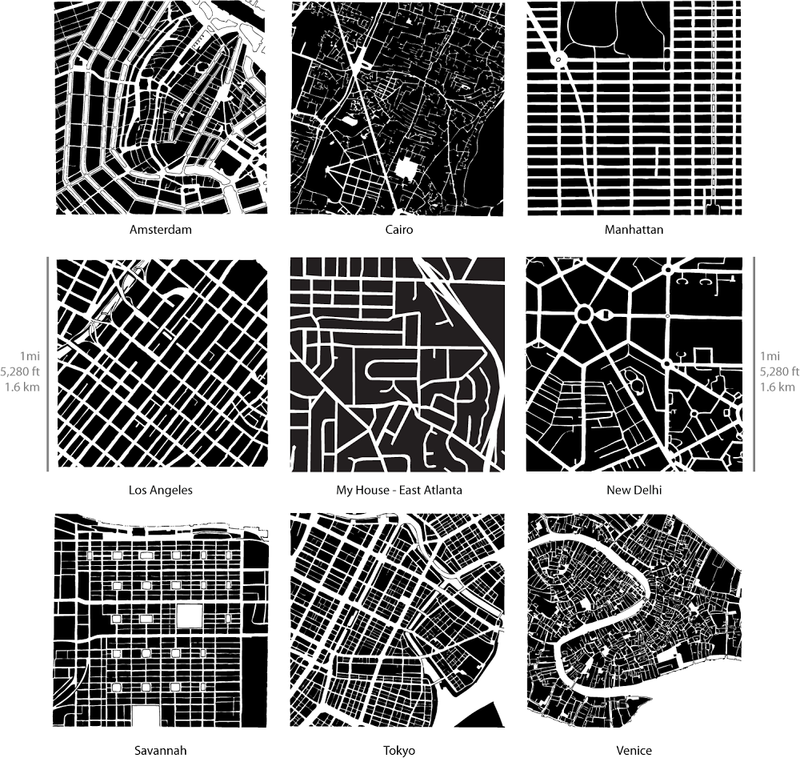 Some of you may be familiar with Alan Jacobs’ book Great Streets, in which he famously compared the street design and layout of several cities around the world using 1 square mi figure-ground diagrams. I decided to create one centered around my home. It is not that hard and could easily be automated (maybe later) using Google Maps. When compared with several of the drawings from Jacobs’ book you can see how my neighborhood suffers from relatively large blocks and poor connectivity. Also there is a large highway barrier along the edge that prevents more connections. I may try to create these for more sections of Atlanta (or find some students’ work at school that has already explored this). Good thinking. Would be nice to pick several stages of Atlanta development. Looks like you're comparing city centers with a somewhat outlying Atlanta neighborhood. Also, Cairo and Venice are almost impossible to navigate as a visitor – much worse than I recall Atlanta being when I was wet behind the ears.